Several things can cause your dog to have a scar and loss of fur. He may have suffered a wound, had an allergic reaction or skin infection, or had surgery that required an incision. No matter what the reason, you should always follow your veterinarian's instructions carefully and properly care for your dog's wound or other skin problems. In time, his fur may grow back normally. Check with your veterinarian before you do anything to help regrow fur on your dog's scar. If the wound was severe enough, the hair loss may be permanent. If the scar is a result of an incision or other skin problem, your veterinarian can give you more specific instructions. Follow them carefully. Keep your dog from licking or biting at the area where he's lost his fur. This is especially important if the fur loss was caused by an injury or incision. His mouth contains harmful bacteria, and licking the area could cause an infection and slow the healing process. The slower the wound heals, the less likely it is that the fur will grow back normally. Check the area every day for signs of trouble, such as bleeding, excessive drainage, a gap over 1/4 of an inch, severe redness, swelling or protruding tissue. If your dog develops any of these symptoms, contact your veterinarian immediately. Allowing these problems to go untreated will make fur growth more difficult and could seriously threaten your dog's health. Use a natural, herbal-enriched shampoo to bathe your dog. Natural shampoos come in varieties that can soothe irritated skin. This will help prevent your dog from itching the skin while it heals. Check with your veterinarian before bathing your dog after an injury, illness or surgery. Ask your veterinarian about supplements available that can help keep your dog's skin and coat healthy. Your veterinarian can recommend a supplement that promotes healing and soothes your dog's irritated skin. Once his skin is no longer irritated and starts healing, the fur may start to grow back. Give your dog flea treatment once a month or as recommended by your veterinarian. 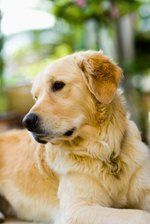 Fleas irritate your dog's skin and may cause him to scratch or bite the area of his skin that's still healing. Some dogs are also allergic to fleas, which can cause loss of fur. Your veterinarian can determine the cause of your dog's fur loss and recommend a flea treatment that's safe for his condition.